Syara’s 17th Birthday Do. | It's my life. At Red Box in Pavilion, a place I haven’t been since high school. Kinda missed the place and all. It’s like buffet style. Free flow of drinks.. bla bla bla. I think you guys basically know how the whole Red Box thing works, so I’m not going to elaborate. 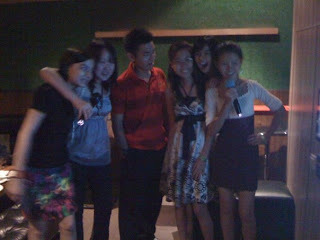 Anyway, I didn’t manage to take loads of picture because I was busy karaoke-ing to snap pictures. So, these are the precious few self-timed shots. Yeah, that’s basically it. I took that ‘many’ pictures then. Well, I do have one more, but I look ugly in it. Haha, but I’m just going to post it anyway. And I have more camwhored shots too. I’m serious, this is so not me. It’s actually a clone of me who happens to look so like me. Oh, like the title suggest, this is Syara, the celebrated one. She’s 17! They give us tags like they do in the theme parks. I think so that we could re-enter without paying again. And oh, I was walking around and I saw this plaid shirt (I have always wanted one but I have yet to find one that fits.) And just maybe this plaid frenzy started cause Martin looked wicked in this one. And he was also wearing plaids when I saw him live in Quattro last year. Hmm, not bad but it doesn’t fit me well. It’s a bit too loose for me. So, the search for a plaid shirt continues for me.